December 5, 2016 -- Tokyo, Japan (TCROSS NEWS) -- Last week Dr. Takashi Ouchi, a reviewer for the Office of Medical Devices III of the Japanese Pharmaceuticals and Medical Devices Agency (PMDA), announced the regulatory process and post marketing surveillance (PMS) policy that will be in effect for the Abbott Absorb bioabsorbable vascular scaffold (BVS). The announcement was made during the Alliance of Revolution and Interventional Cardiology Advancement (ARIA) meeting held in Fukuoka, Japan on November 30-December 1. The Abbott BVS was approved in Japan on November 2. The Japanese approval was based on the results of three studies including AVJ-301 (ABSORB Japan), the ABSORB III clinical trial, as well as the ABSORB III Pharmacokinetic study. The manufacturer also provided a series of clinical trials, shown below. The primary end point was met in ABSORB Japan and ABSORB III demonstrating non-inferiority of BVS in comparison to Xience stent (DES). Absorb GT 1 is indicated for symptomatic ischemic heart disease patients with newly developed coronary stenosis (lesion length less than 24mm) having a reference vessel ranging between 2.5mm and 3.75mm. Dr. Ouchi stressed that appropriate measurement of Reference Vessel Diameter (RVD), proper size of vascular scaffold, and relevant pressure of post dilatation were key elements for minimizing ST rate after implantation of BVS. Unlike the use of standard drug-eluting stents (DES), the operator must handle BVS more carefully. For example, delivering a post dilatation balloon catheter across BVS requires special caution which is not necessary during implantation of DES. According to the latest report demonstrating the clinical outcome of more than one year after the implantation, the number of clinical events (including ST) was considerably higher in the BVS group than in the DES group. PMDA carefully inspected its risk and benefit to make the final judgement of the product approval. The first and most important benefit regarding the BVS is its absorption property, whereas the risks include a higher incidence of ST and MI, clinical events during late and very late phase, and difficult/complicated procedure as compared to DES implantation. 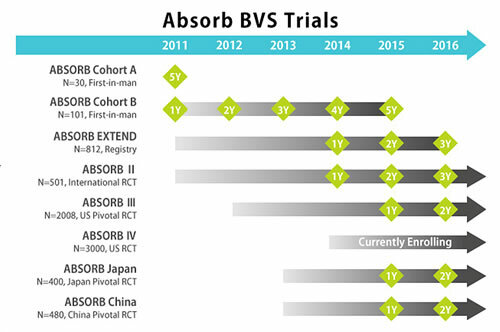 Although these issues remain unresolved, PMDA approved the clinical use of BVS under four conditions: 1) releasing appropriate guidance for use in cooperation with the Japanese Association of Cardiovascular Intervention and Therapeutics (CVIT); 2) collecting post market surveillance data; 3) collecting all ST events; and 4) reporting long-term outcomes included in ABSORB Japan study. Under the collaboration with CVIT, BVS initially will be distributed to limited sites (ABSORB Japan investigator sites and CVIT authorized sites) and all cases must be registered in the J-PCI database, organized by CVIT. All outcomes of the initial 2,000 cases performed by the limited sites must be reported within a certain period of time as part of a treatment outcomes study. The number of investigator sites gradually will be increased after verification of lower ST rate (less than 0.9%) within the first three months of index procedure. Meanwhile, the investigator site policy will be modified if the 2-year ST rate of 250 cases of ABSORB Japan sites falls within 1.5%. If the rate of ST within the first 3 months is higher than 0.9%, investigations of the causes and supervision as to appropriate action to lower ST will be imposed. Participation in the product training program provided by the company (Abbott Vascular) is mandatory for the use of BVS in Japan. The first three cases must be performed under the surveillance of a well-trained interventional cardiologist with sufficient knowledge of the product or an appropriate representative of Abbott Vascular. Additionally, prospective investigator sites must have a vascular imaging system (IVUS or OCT) with the presence of an interventional cardiologist familiar with imaging guided intervention. A prospective investigator site is defined as a site enrolled in ABSORB Japan or a site with the presence of a CVIT certified interventional cardiologist performing more than 100 PCI cases per year. For additional requirements of further expansion of prospective investigator sites, a certified interventional cardiologist authorized by CVIT must be present and must agree to provide detailed information when ST occurs. Dr. Ouchi concluded, "BVS will be available in near future. We will accumulate data to drive the product in right direction."